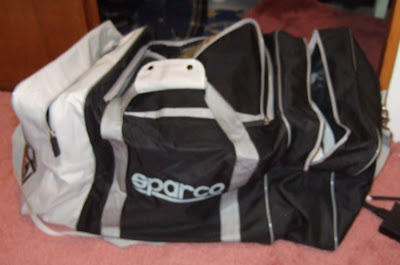 Ordered a nice Sparco Bag that just came in today. 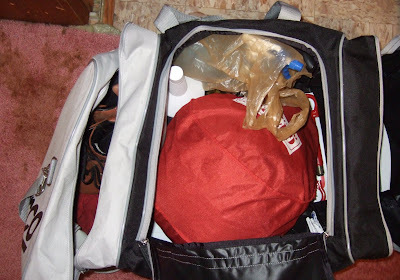 Decided that grocery bags were no longer cutting it in terms of storage and carrying things to autocross events. Looks really nicely made with plenty of room for goodies, so I can't wait to try it out this weekend. Already packed up and ready to go to! For the price, the quality and the size, I would have to say this bag was certainly worth it. Big ups to Dan from Assaultech. As for the power steering update, sadly it had taken Liberty Mazda a whole week to receive the harness from Mazda North America. Splice off the old one, solder in the new one and wrap is all they did. Upon inspecting the old one, it looks like radiator fluid from the overflow had managed to leak into the connector. Everything feels great right now, so we'll see what happens during this weekend's event and overtime. Stay tuned.